This guest blog post is written by Cristian Ordonez. Cristian loves writing, music, photography, traveling, and spending time outdoors. 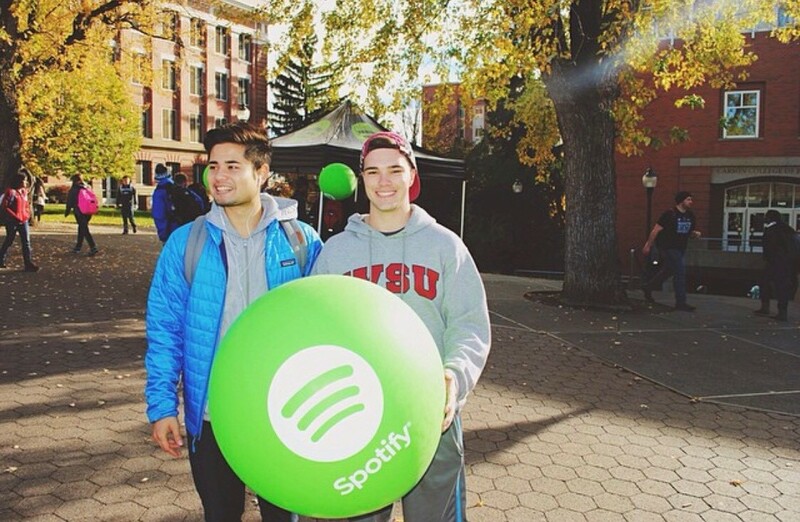 A recent graduate of Washington State University, Cristian currently works in the Tableau Sales Operations department. When I was approached about authoring a blog for Hispanic Heritage Month, I was excited to participate. To honor Hispanic Heritage Month, we're shining the spotlight on work created by and about this community. If you're interested in learning more about Hispanic Heritage month, visit here. My Hispanic heritage is essential to who I am and many of my values come from my Nicaraguan background. My mother instilled in me the importance of family, a love of music, and the joy of a sharing a meal with people you love. She was born in Nicaragua and came to the U.S. as a young woman, receiving higher education here. Both she and my father were immigrants and stressed the importance of getting a college degree. My parents were able to impart to me the advantage that a good education can provide, opening up opportunities that might not be otherwise available. I was fortunate enough to attend Washington State University and have an extraordinary experience, which ties into the viz I've chosen for Hispanic Heritage month. But before we get to that, I want to share my "Tableau story." While at Washington State University, I took a data visualization course exploring the work of Dr. Edward Tufte, the "da Vinci of data". The syllabus said to download Tableau software and this simple instruction changed everything for me. I discovered a new way of viewing the world and this sleek, clean, and intelligent platform ignited a curiosity about data and data analytics that I didn't know I had. That semester I found myself spending hours with my class teaching assistants to dive deeper and create increasingly complex and interesting visualizations. 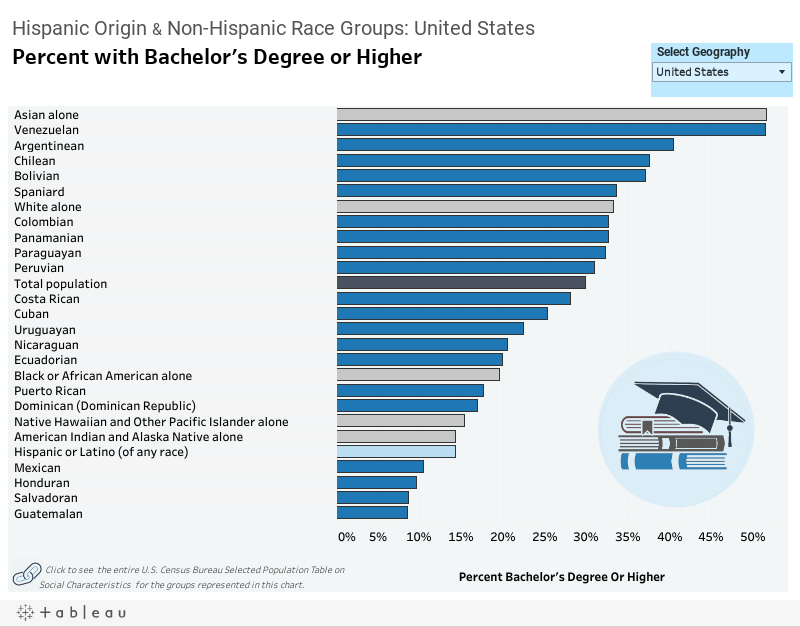 For Hispanic Heritage month, I've chosen a visualization that breaks down the percentage of students who have obtained a bachelor's degree or higher in the United States, breaking out students of both Hispanic and non-Hispanic origin. It was fascinating to filter by state and view a few trends, but also observe how the percentages changed by group. Besides seeing educational achievement, I also saw shifts in representation across each state which indicated the level of the state's diversity regarding students of Hispanic origin. I am proud to say that I am of Nicaraguan descent, a college graduate, and a lover of Tableau. This viz represents all of those things. As we continue to celebrate Hispanic Heritage Month, I encourage all my fellow community members to share vizzes that speak to their identities using the hashtag #VisualizeDiversity!